This weekend we took the "Perfect Pizza at Home" class at Sur la Table. Each pizza was made with Neapolitan pizza dough. We made a Classic Pizza Margherita, Pizza Bianco with Four Cheeses, and Pizza with Italian Sausage, Broccoli Raab, and Fresh Mozzarella. First, I have to say the class was so fun! Ash and I both cook a lot but we'd never taken a formal class (unless you count my 6th grade Home Economics (could never figure out why its called that) class, which you shouldn't...trust me. My spaghetti pie was nothing to write home about). Ash and I put cooking class on our list of fun things to do for date night this year but we haven't gotten around to it. Imagine my surprise when I found out my mom booked one for us. I highly recommend it. Second, I made a bunch of fresh mini pizzas in two hours and discovered some cool gadgets along the way. Hello, Petit Pizzeria. Of all three pizzas, my favorite was the Pizza Bianco, which is why I decided to share it for the 30 Days challenge. I know as you read through the recipes, it may all seem a bit complicated or labor intensive. Trust me, it's not. It really all came together so easily. I would totally do this at home (and will because I invested in the Petit Pizzeria after class). All recipes are from Sur la Table. If you want the other two recipes, let me know in the comment section and I will post them. Hope you're enjoying the weekend! Place a pizza stone in the lower third of your oven and preheat the oven to 500 degrees. Allow the pizza stone* to preheat for at least 30 minutes. Once the stone is preheated, you can stat rolling out your dough. Dust work surface with flour. Flatten one dough ball to a thickness of 1/2 inch, and roll to a diameter of about 5 inches, keeping the remaining dough covered. Transfer to a parchment paper-lined rimmed baking sheet and cover with another piece of parchment. Continue rolling dough balls and placing on the baking sheet, separating layers of rolled dough with additional sheets of parchment as needed. Cover stack of dough rounds with plastic wrap and set aside. Sprinkle a pizza peel with some cornmeal and place a dough round on the peel. Give the peel a little shake to make sure the dough moves freely and is not sticking. Brush the dough with some olive oil. Sprinkle with some salt, garlic and rosemary. 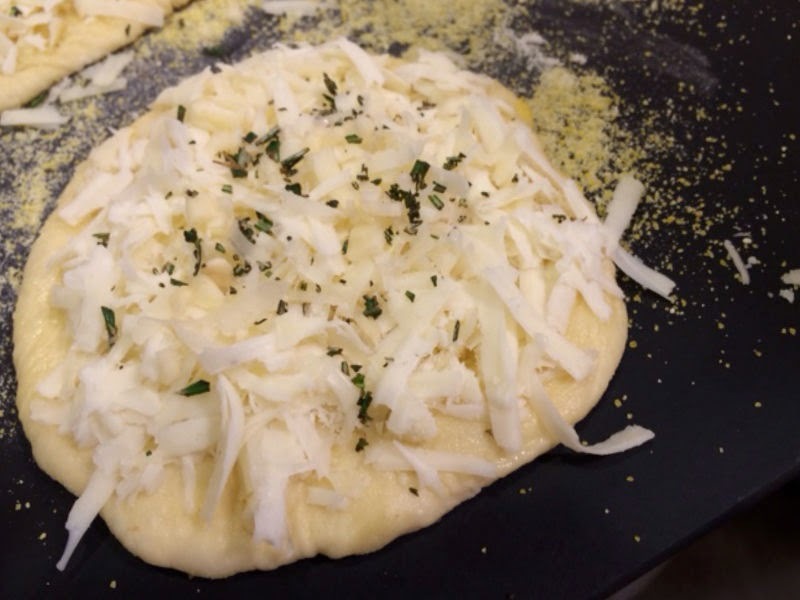 Grate some of each of the cheeses onto the dough. If there is one cheese that you like more than the rest, go a little heavier with that cheese. Open the oven and slide the pizza off of the peel and onto the pizza stone. Allow your pizza to cook until you have reached your desired crust crispness. Remove the pizza from the oven and place on a cutting board. If you let the pizza rest for 1 to 2 minutes before you cut it, you will get prettier slices. Recipe yields 8 individual 5-inch pizzas. * If you don't have a pizza stone, you can use a baking sheet but be sure to use a lot of olive oil and cornmeal on the bottom so it doesn't stick or burn. Place flour, sugar, salt and yeast in the bowl of a stand mixer fitted with a dough hook. Mix on low speed for 30 seconds to combine. With the mixer running on low speed, add water and olive oil and mix for 1 minute to combine. Increase speed to medium and process until dough form a slightly sticky ball, about 1 to 2 minutes. If ball does not form, add more flour, 1 tablespoon at a time, and continue mixing until ball forms. Coat a large mixing bowl with a thin film of olive oil. Transfer dough ball to prepared mixing bowl and cover with plastic wrap. Let rest until doubled in volume, about 1 1/2 to 2 hours. Once dough has finished resting and rising, press dough gently to remove air bubbles, and turn out on a lightly floured surface. Using a bench scraper, divide dough into 8 equal pieces. Roll each piece into a tight ball. Cover loosely with plastic wrap and allow to rest for 15 minutes. Dust work surface with flour. Flatten one dough ball to a thickness of 1/2 inch and roll to a diameter of about 5 inches, keeping the remaining dough covered. Transfer to a parchment paper-lined rimmed baking sheet and cover with another piece of parchment. 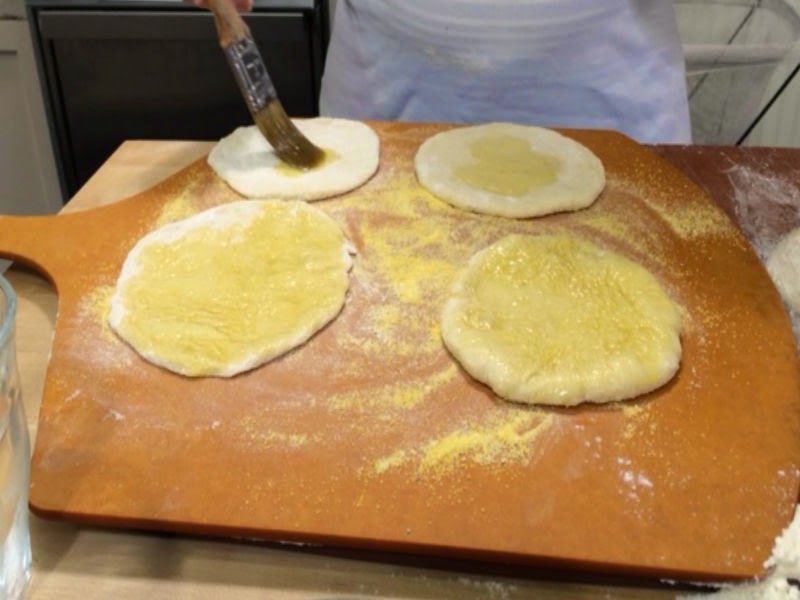 Continue rolling dough balls and placing on the baking sheet, separating layers of rolled dough with additional sheets of parchment, as needed. Cover stack of dough rounds with plastic wrap and set aside.